Florida is suing Walgreens and CVS, two of the largest drugstore chains in the nation, among other opioid distributors and producers, for their role in the opioid epidemic. The lawsuit alleges that Walgreens has dispensed billions of doses of opioids in Florida pharmacies since 2006. In some stores, its opioid sales jumped six-fold in two years. The lawsuit further alleged that in 2011, Walgreens’ pharmacies in Florida ordered more than one million dosage units of oxycodone. That’s ten times the average amount. Five years ago, the company paid $80 million to resolve a federal investigation that centered on inadequate record keeping of its Florida opioid sales. The inadequate record keeping allowed opioid pills to get to the black market. The lawsuit revealed that a Walgreens distribution center sold 2.2 million opioid tablets to its pharmacy in Hudson, a tiny town, population 12,000. That’s about a six month supply for each resident. In another town, not identified in the lawsuit, Walgreens sold 285,000 pills in a month to a population of 3,000. It also shipped more than 1.1 million opioid pills to two pharmacies in Fort Pierce–— 1.1 million pills each. In regard to CVS, the lawsuit accuses the company of distributing more than 700 million dosages of opioid meds in the State of Florida through 754 Florida stores between the years of 2006 and 2014. CVS also paid $22 million to settle allegations that its pharmacists were filling fake opioid prescriptions in 2015. “Armed with knowledge of their own sales and shipments and industry-wide data, Defendants knew or should have known that the quantity of opioids being distributed in Florida far exceeds the medical need of Florida residents,” the lawsuit said. CVS and Walgreens are not the only pharmacies being sued in this lawsuit. The lawsuit was filed in May and already includes other opioid distributors like InSys. (They aggressively marketed SubSys, a fentanyl spray.) Also included are opioid manufacturers, like Purdue Pharma, (OxyContin), Endo Pharmaceuticals, (Percocet) and Teva Pharmaceuticals, who manufactures generic drugs. Walgreens said they don’t comment on pending lawsuits. Mike DeAngelis, spokesman for CVS, said the lawsuit is “without merit.” He stated that CVS trains its employees to properly shoulder their responsibilities when they are dispensing controlled substances, and that the company gives pharmacists and their assistants tools to detect illegal sales. “Over the past several years, CVS has taken numerous actions to strengthen our existing safeguards to help address the nation’s opioid epidemic,” DeAnglelis said. Walgreens and CVS are working to install drug take back kiosks in their pharmacies, where patients can return unused or expired drugs, in an effort to help with the opioid crisis. The office of Indiana Attorney General Curtis Hill and its Mobile Operations Center will visit Kokomo Friday to hold a prescription drug takeback event. The public is invited to the event, which will be held from 10 am to 2 pm at Ivy Tech Kokomo, which is located 1815 E. Morgan St. in Kokomo, IN. The public is encouraged to bring unused, unwanted or expired medications for safe disposal. Local law enforcement and members of the Attorney General’s office will be on campus to collect prescription drugs. From 10:00 a.m.- 2:00 p.m.
You are invited to bring your unused, unwanted or expired medications to this event in order to dispose of them safely and prevent them from posing future hazards. 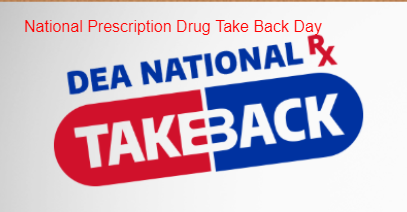 The Prescription Drug Take Back event helps keep old pills from being abused. The FDA is recalling Irbesartan and Losartan, more angiotensin II receptor blockers (ARBs), after discovering traces of NDEA in them. This new recall is for Losartan sold by Sandoz. The recall is only for the 100mg/25mg tablets and does not involve other versions of the losartan drug. This recall impacts less then 1% for the total losartan drug products in the US market. However, it is only the tip of the iceberg for pharmaceutical products from the same manufacturer found tainted with amounts NDMA and NDEA that are not safe by the FDA’s standards. The active ingredient in the recalled lot of losartan tested positive for NDEA. NDEA is a suspected human and animal carcinogen. It was found within an ingredient that was made and supplied by the Zhejiang Huahai Pharmaceutical Company Co. Ltd. This same company supplied the tainted active ingredient used in the recalled lots of valsartan. After the European Medicines Agency, (EMA), and then the FDA, confirmed the presence of NDMA and NDEA impurities in Valsartan, the FDA launched an investigation, including an inspection of the Zhejiang Huahai facility. They found traces of both NDEA and NDMA. At the end of September, the FDA placed the Chinese company on an import alert, which means that any active pharmaceutical products or finished products from the company would not enter the United States. Valsartan is used in blood pressure medication and some vaccine products, among others. The FDA is testing all ARBs- for NDEA and NDMA impurities and is keeping an ongoing list of recalled medicines and those that are not going to need to be recalled. In August, 2018, FDA Commissioner Scott Gottlieb, M.D., and Janet Woodcock, M.D., director of the Center for Drug Evaluation and Research, released a statement on the FDA’s ongoing investigation into valsartan impurities and recalls. They described what caused the impurity in the drugs, what the FDA is doing about it, and the risk assessment for patients who have been taking the tainted drug. That estimate was based on the highest daily dose, however many people may have taken lower doses, and therefore their risks would be less. FDA expects the actual cancer risk to most consumers to be lower than the estimate. The losartan recall is for lot number JB8912. If you are taking losartan, you can check the lot number on the bottle and see if the numbers match. If your drug is on the recall list, the FDA suggests that you continue to take it until you can get a replacement from a Doctor or Pharmacist. Questions regarding this recall can be directed to Sandoz Inc. at 1-800-525-8747 Monday-Friday 8:30 AM – 5:00 PM (EST) or email usdrugsafety.operations@novartis.com. Teva Pharmaceuticals USA today confirmed a voluntary recall to the consumer / user level of 29 lots of single and 51 lots of combination valsartan medicines . The products subject to recall are packed in bottles. These lots were distributed Nationwide to Teva’s Direct Accounts (Wholesale/Distributor/Retail/Repackagers/VA Pharmacy, et. al). These were distributed under the Actavis label in the U.S. They are being recalled due to the detection of trace amounts of an unexpected impurity found in an active pharmaceutical ingredient (API) that was manufactured by Zhejiang Huahai Pharmaceutical. Teva is not the only company to recall Valsartan. Major Pharmaceuticals, and Solco Healthcare are also recalling Valsartan/ Hydrochlorothiazide due to the same impurity detected. The FDA action came after 22 other countries issued recalls involving 2,300 valsartan batches sent to Germany, Norway, Finland, Sweden, Hungary, the Netherlands, Austria, Ireland, Bulgaria, Italy, Spain, Portugal, Belgium, France, Poland, Croatia, Lithuania, Greece, Canada, Bosnia and Herzegovina, Bahrain and Malta. N- nitrosodimethylamine (NDMA) has been classified as a probable human carcinogen as per International Agency for Research on Cancer (IARC) classification. The toxin affects the liver and causes liver fibrosis or scarring and liver tumors in rats.Exposure to high levels of NDMA may cause liver damage in humans, according to the US Environmental Protection Agency. Don’t stop taking your blood pressure meds!! First of all, not all medicines containing valsartan are involved in the recall. Check the FDA recall site or call your pharmacy to find out if the bottle you have is from a contaminated lot before taking further action. Questions, concerns, adverse reactions or quality problems experienced with the use of this product may be reported to Teva directly at 888- 838-2872 or to the FDA’s MedWatch Adverse Event Reporting program either online, by regular mail or by fax. E-cigarettes are battery-operated devices that look like a real cigarette: kind of pen-shaped. Some look a bit different- those with refillable tanks, for example . There are nearly 500 brands of e-cigarettes on the market, in more than 7,000 flavors. They have containers filled with liquid, ingredients vary with the brand or type. A heating device turns the liquid into vapor that you inhale when you take a drag. The FDA was given the power to regulate the manufacturing, labeling, distribution and marketing of all tobacco products in 2009 when President Obama signed into law the Family Smoking Prevention and Tobacco Control Act and in 2010 a court ruled that the FDA could regulate e-cigarettes as tobacco products. It wasn’t until 2016 that the FDA finally announced a rule to regulate e-cigarettes. Under the final rule, the FDA plans to ban the sale of e-cigarettes to anyone under the age of 18. The rule also requires all makers of e-cigarettes sold after February 15, 2007 to go through a “premarket review.” This is the process that the FDA uses to determine whether potentially risky products are safe. However, companies are allowed to have anywhere from 18 months to two years to prepare their applications. And it will take another year for the FDA to actually approve these applications. So don’t expect e-cigarettes currently on the market to be officially allowed to be sold by the FDA for another couple of years. The popularity of electronic cigarettes has outpaced available scientific data. Research is still preliminary and answers may vary slightly. Overall, here are some points all experts agree on. E-cigarettes are not safe, regardless of how they are marketed to appear to the public. Yes, they may be safer than conventional cigarettes, but they are not safe on their own merit. The e-cig works by heating a liquid to generate an aerosol (we call it “vapor”) that is inhaled by the user. The e-liquid in the cigarette (or “e-juice”) is commonly made of nicotine, propylene glycol, glycerine and flavorings. E-cigarette users who use e-cigarettes that contain nicotine are exposed to its potentially harmful effects. Nicotine is associated with cardiovascular disease, potential birth defects, and poisoning, among other deleterious effects. Normal usage of e-cigarettes generates low levels of formaldehyde. Degraded products will produce very high levels of formaldehyde in the vapor. Most users will detect the degradation and avoid using the degraded product, but there is still a slight risk. Formaldehyde is a well-known carcinogen. Exact measurements have not been established. Too much formaldehyde inhalation will cause respiratory symptoms like itchy nose and throat, coughing, and nosebleeds. It may be implicated in respiratory diseases like asthma. A little exposure once in a while will usually fade, but continuous exposure to high levels of formaldehyde might increase the chance of getting cancer even at levels too low to cause noticeable symptoms. Metal parts of e-cigarettes in contact with the e-liquid can contaminate it with heavy metal toxins. One of the flavors used in e-cigs is diacetyl, a harmful chemical which causes a lung disease known as ‘popcorn lung’, among other harmful effects. No long-term data is available on the overall effects of e-cigs on the lungs. In particular, the effects in people with respiratory diseases are still unknown. “No long term data” does not equal, “Safe to Inhale!” It merely states that there is no current information. According to a study by VA San Diego Healthcare System and UC San Diego researchers, human cells exposed to the e-cigarette vapor showed several forms of damage, including DNA strand breaks. When the DNA is harmed and the cellular repair process doesn’t work right, it raises the risk of cancer. The affected cells were also more likely to launch into apoptosis and necrosis, which lead to cell death. The team used normal epithelial cells, which line organs, glands, and cavities throughout the body, including the mouth and lungs. The San Diego team found that the nicotine versions caused worse damage, but even the nicotine-free vapor was enough to damage cells. Nicotine free e-cigarettes caused 50 per cent more DNA breaks, while those containing nicotine raised the damage margin three fold. They were able to identify that e-cigarettes on the whole have something to do with increased cell death but not necessarily the individual components that are contributing to the effect. There is limited information available on the environmental issues around production, use, and disposal of e-cigarette cartridges. A 2014 review recommended that e-cigarettes should be regulated for consumer safety. There is a concern that some of the mainstream vapor exhaled by e-cigarette users can be inhaled by bystanders, particularly indoors. The liquid used in e-cigarettes is highly concentrated, so absorbing it through the skin or swallowing it is far more likely to require an emergency room visit than eating or swallowing regular cigarettes. In 2012, less than 50 kids under the age of six were reported to poison control hotlines per month because of e-cigarettes. In 2015, that number rose to about 200 children a month, nearly half of which were under the age of two. E-cigarettes aren’t thought of as 100% safe, but most experts think they’re less dangerous than cigarettes, says Neal Benowitz, MD, a nicotine researcher at the University of California at San Francisco. Tobacco smoke contains 100 known carcinogens, and 900 potentially cancer causing chemicals, none of which has been found in more than trace quantities in e-cigarette vapor. Those present are mostly below 1% of the corresponding levels in tobacco smoke Another review found that compared with cigarettes, e-cigarettes are likely to be much less, if at all, harmful to users or bystanders. The e-cigarette aerosol can contain toxicants and traces of heavy metals at levels permissible in inhalation medicines, and potentially harmful chemicals not found in tobacco smoke- at concentrations permissible by workplace safety standards. When vaping, there is no ash, tar, carbon and carbon monoxide entering inhaler’s lungs. However, chemical concentrations may exceed the stricter public safety limits. There is considerable variation between vaporizers in terms of quality of their liquid ingredients and thus the contents of the vapor. A study funded by Cancer Research UK showed that when smokers switched completely to e-cigarettes, bodily level exposure to established and important smoking-related carcinogens and toxicants was reduced by between 56 percent to 97 percent. E-cigarettes are a safer alternative to smoking tobacco in the context of developing smoking-related cancer. Dr. Lion Shahab reported that according to the study, smokers who switched entirely to e-cigarettes cut their intake of toxins and carcinogens. Levels of nicotine — the addictive ingredient in cigarettes — remained constant, but their intake of cancer-causing chemicals fell to levels found in people using nicotine-replacement therapies. E-cigs reduced toxin intake at a level comparable to those who quit smoking by using nicotine replacements like the patch, gum or lozenges. Can They Help Me Quit Smoking? The American Heart Association says e-cigarettes should only be used as a last resort way to quit. There is research that supports the idea that e-cigarettes can reduce smoking urges and help motivated smokers quit. Last year, two out of three smokers who combined e-cigarettes with expert support from a local service quit successfully. E-cigs have been shown to be as effective as nicotine inhalers in reducing both craving and withdrawals effects. Another study found that e-cigs may be comparable, but not more effective, than other methods for smoking cessation, like nicotine patches and even placebo e-cigs. Whether e-cigs can safely help people quit smoking remains to be seen. According to the FDA, there’s no evidence any e-cigarette is safe and effective at helping smokers quit. The best thing a smoker can do is quit completely now and forever. The best way to succeed is to get help from your local stop smoking service. Smokers who have struggled to quit in the past could try vaping, and vapers should stop smoking. Talk to your doctor about medications and other strategies that are proven stop-smoking tools. And if you need help quitting or reducing the number of cigarettes you are smoking, check out the smokefree.gov website. MyNicNaxs, LLC, Deltona, FL is voluntarily recalling all lots of dietary supplements distributed nationwide to consumers and stores. All lots means every bottle that went out of their warehouse, of every product they were selling. Unfortunately, they are not the first company who needed to recall weight loss and sexual enhancement products. These niches seem to be rife with undeclared, misleading, and plain dangerous pills. Dozens of weight-loss and immune-system supplements on the market are illegally labeled and lack the recommended type of scientific evidence to back up their purported health claims. MyNicNaxs, LLC, Deltona, FL, is- or was- a company selling both dietary supplements for weight loss and sexual enhancement. Unfortunately, the dietary supplement (or “chinese medicine”) was a misleading name for products that contained undeclared active pharmaceutical ingredients. The FDA went to court to complain. First, they alleged that certain MyNicNaxs products are drugs under the FD&C Act because they are intended to cure, mitigate, treat or prevent disease. Second, the drugs were misbranded because their labeling was false and misleading in that it didn’t declare certain active pharmaceutical ingredients. The labeling failed to bear adequate directions for use, and/or the drugs are dangerous to health when used as recommended in the labeling. The following permanent injuction required the defendants to stop distributing any unapproved new drugs or misbranded drugs. They were prohibited from receiving, manufacturing, holding and distributing any drugs or dietary supplements until the FDA puts out a written notification that they are in compliance of the FD&C Act and its regulations, and that they may resume operations. The MyNicNax website is down, but the pinterest account is still up with photos of the products and promotional photos. The FDA discovered the presence of Sildenafil, Sibutramine, Diclofenac and/or Phenolphthalein in the dietary supplements. This rendered the supplements as an unapproved drug for which safety and efficacy have not been established. These products were distributed from January 2013, to December 2017, though the website http://www.mynicnaxs.com. The undeclared drugs can cause serious health risk. A)Some of them are cancerous, and B)Taking drugs unknowingly can interfere and interact with other drugs the person is taking. Or can expose the consumer to a drug that is harmful or dangerous in their particular situation… a drug they would never take if they knew it was in the magic pill. Sibutramine is the active pharmaceutical ingredient in Meridia, a new drug approved by FDA for marketing in 1997 for prescription treatment of obesity and, subsequently, withdrawn from the U.S. market on December 21, 2010, after clinical data indicated Sibutramine poses an increased risk of heart attack and stroke. Phenolphthalein is a known carcinogen (cancer causing agent) It was once an ingredient used in over-the-counter laxatives. It is no longer approved for marketing in the United States. Sildenafil is the active pharmaceutical ingredient in Viagra (PDE-5 inhibitor), a drug approved by FDA for the treatment of erectile dysfunction. PDE-5 inhibitors may interact with nitrates found in some prescription drugs (such as nitroglycerin). PDE-5 inhibitors can lower blood pressure to dangerous levels. Diclofenac is a non-steroidal anti-inflammatory drugs (NSAIDs) found in FDA-approved drugs that are used to treat pain and inflammation associated with several conditions. NSAIDs could lead to serious GI trouble, like bleeding, ulceration, and fatal perforation of the stomach and intestines. Patients who are already taking medication that could cause bleeding may increase their risk for bleeding significantly. This is a list of all the website products, as listed on the FDA website: 26 products in all that did not disclose drugs in the ingredient list on the bottle. If you have bought any of these products, you are advised to immediately discontinue use. There have been no reports of adverse effects so far. If you think you have experienced adverse effects, speak to your health care provider immediately. You should also report to the FDA MedWatch Adverse Event Reporting Program by filling out the online form, or sending the form by regular mail or fax. For any questions regarding this recall, contact Mike Banner by phone 407-791-3597 or Chevonne Torres 386-337-8142, Monday to Friday, 09:00am-5:00 pm, Eastern Time. Is Shaking Hands a Risky Business? The handshake dates back to the 5th century B.C., in Greece. It was a symbol of peace, each man showing empty hands to prove he wasn’t carrying a weapon. Some claim that the handshake really started in Medieval Europe, where the knights would shake other’s hands in an attempt to shake loose hidden weapons. Whether a symbol of peace, or a way to allay suspicion, the handshake is losing popularity as a greeting. In the U.S. it is becoming more and more common to use a fist bump. Forty-nine percent of Americans today will choose the fist bump over the traditional handshake. How Many Germs Are Really On Your Hand At Any One Time? It’s fair to say a lot of them, especially if you haven’t washed your hands recently. Every time you touch an object or shake someone’s hand, you are probably picking up bacteria and potentially viruses too. We’re estimated to have around 1,500 bacteria living on each square centimeter of the skin on our hands. Areas such as underneath the fingernails and between the fingers often harbor even more. According to Research from the University of Colorado at Boulder, on average we carry 3,200 bacteria from 150 different species on our hands. Bacteria on the hands can be divided into two categories: Resident, and Transient. Resident flora (or microbiota, if you want to be precise) consist of microorganisms that reside beneath the surface of the skin, but can also be found on the surface of the skin. They are mostly known to researchers because the common ones tend to recur. Resident flora is more resistant to removal by routine hand-washing and hygiene. At the same time, resident flora is less likely to cause serious infections beyond local infections on broken skin, in eyes, or sterile body cavities. Transient flora (transient microbiota), which colonizes the superficial layers of the skin, is more amenable to removal by routine hand hygiene. It is acquired most often by direct contact with other people or contaminated surfaces. The strains on your hand can’t be predicted as easily. Different people pick up different germs. Some kinds of activities result in higher levels of contamination. One highly germy job is working with babies- spit up and other respiratory secretions, diaper changing and direct skin contact all contribute to high levels of bacteria on a caretaker’s hands. However, any job that requires you to use your hands or any part of your hands will result in contamination. Germs find their way onto hands in less obvious ways than changing a baby’s diaper: handling raw meats, touching keyboards and doorknobs, touching any surface that has been coughed or sneezed around, or touching anything that was touched by a hand already contaminated by something it has touched. So even if you are so careful not to touch a doorknob, your colleague who touched the doorknob and then touched your desk can easily pass the germs from the doorknob over to you and your hands. Depending on where you’ve been and who you’ve been around, the germs on your hand may include the common flu virus, Salmonella, E. coli O157, respiratory infections like adenovirus and hand-foot-mouth disease. Norovirus is alsao likely- it causes the viral gastroenteritis that can so rapidly spread through retirement homes and cruise ships. Scientists say germs may be good for us in small measure. According to “the hygiene hypothesis,” exposure to germs and allergens helps our bodies develop immunity to them. This results in less allergies and illnesses. There have been studies that link having a dirty home or growing up in germ-rich places like a farm with reduced allergies and asthma. So don’t take personal hygiene too far and get rid of too much of the germs our bodies need to be exposed to in order to develop the immune system. This applies especially to children! Normal human skin is colonized by bacteria. Bacteria impacts your personal health in both positive and negative ways. For better or worse, they are a part of you! According to Dr Noah Fierer, who led one of the germs-on-hands studies, the types of bacteria on human hands are very diverse. Each person’s bacterial “fingerprint” is unique. So it doesn’t seem like there is that much sharing going on, despite all that handshaking. When a study was done on a college campus, the researchers were surprised to find that, among 51 college students’ hands’, there was a low number of species that were shared. The number of different species of bacteria found on each hand also shocked them. On top of all that, there was a difference in the amount and type of bacteria between left and right hands, and there were differences between men and women’s hands. Not only did individuals have few types of bacteria in common, the left and right hands shared only about 17 per cent of the same bacteria types. The way your hand interacts with the environment affects the kind of bacteria on it. The transmissibility of transient flora depends on the species present, the number of microorganisms on the surface, and the skin moisture, pH factor, oil and salinity of the hand. That’s a lot more factors at play. It’s not as simple as Handshake=Staph Infection. Having said all that, hand washing is important. There are certain diseases and infections have been shown to be significantly reduced with hand-washing practices, like the norovirus, and respiratory infections. In a case where there is immune deficiency, or in a place where there is a greater likelihood of meeting virulent bacteria, extra care should be practiced with hand-washing and hand sanitizing. Many hospitals employ a rigorous hand-washing policy. Hospital-related infections kill 16 million patients yearly. Washing hands has been proven to reduce the amount of infection. So washing your hands can save lives of people in the hospital, or the elderly and the young. Sing “Happy Birthday” twice. That’s how long you should scrub for. Make sure to rub between fingers and nails. These are the hotbed areas for germs on your hands. Don’t forget to wash the backs of your hands: Rub one palm over the back of the other, then swap hands. Consider using a clean towel to turn off the tap. You just turned the same tap with your un-washed hands two happy birthday songs ago. The best way to clean your hands is not so much what you use, but how you use it. The physical action of washing hands by rubbing them together is the best way to get rid of germs. Soap and water can outperform antibacterial products as long as you spend enough time scrubbing your hands. The FDA declared antibacterial soaps can no longer be sold if they contain any one of 19 forbidden ingredients, including triclosan (used in liquid soaps) and triclocarban (used in bar soaps). Manufacturers haven’t been able to prove that the ingredients are more effective than plain soap and water in spreading infection and preventing illness. They also haven’t demonstrated long-term safety for daily use. Some people don’t shake hands- for religious reasons. Orthodox Jews, for example, have this custom. They will usually let you know, politely and respectfully, that they observe this religious custom. To dispel a myth, it emphatically has nothing to do with impurity, or with social or religious status. The rule is that people of the opposite gender do not even touch each other, let alone shake hands, unless they are husband and wife, siblings, or children with parents and grandparents. Different cultures have different greetings. Even with the handshake, the etiquette shifts. Who holds their hand out first? Before shaking hands in other countries, find out what the handshaking etiquette is. There’s an amazing diversity of greeting customs around the world. In Tibet, they stick their tongues out by way of greeting. In New Zealand, Maori greet each other by touching noses. Men in Ethiopia touch shoulders. In the Democratic Republic of Congo, men touch foreheads. In some Asian countries, people bow to each other. In some European countries, hugs and kisses are a standard greeting ritual. Imagine the germs you can get by doing that! Fluticasone Propionate Nasal Spray USP 50 mcg per spray 120 Metered Sprays is used to treat seasonal allergic rhinitis and perennial allergic rhinitis. It is also perscribed for managing sinus pain and sinus pressure – the kind associated with allergic rhinitis for patients of certain ages. Apotex Corp., a company that produces Fluticasone Proprionate Nasal Spray, issued a voluntary recall of Fluticasone Propionate Nasal Spray USP 50 mcg Per Spray 120 Metered Sprays . The reason was potential for small glass particles. The company is recalling one lot of the product that has reached the consumer level. The particular lot of the Nasal Spray was found to contain small glass particles that were blocking the actuator and impacting the function of the spray pump. The issue was discovered after a customer complained. Always complain if you buy a pharmaceutical product and it doesn’t work the way it it supposed to, even if the flaw seems to be merely technical. The entire lot of it may be faulty and you may be helping many people by alerting the company to the problem. There is also potential risk that patients using the product would be exposed to the glass particles-i.e., spray them up their noses. That would cause local trauma to the nasal mucosa, or “mechanical irritation” that may cause worse nose problems than the patient had before. Imagine what a particle of glass could do if it got stuck in the sinuses or the nasal passages. If you are a consumer with an inventory of the lot subject to this recall, stop using or distributing the units remaining in your possession and put them aside immediately. Notify your Doctor or Healthcare Professional about this recall if you’re reading this and think they may be distributing this product. Notify anyone that has bought or received this product from you about the recall. Call GENCO Pharmaceutical Services, a subsidiary of FedEx Supply Chain (GENCO) at 1- 877-475-5863 (7:00am – 5:00pm, CST Monday thru Friday), to arrange for return of the product. Contact your physician immediately if you have experienced any problems that may be related to taking or using this drug product. You can report adverse reactions or quality problems to the FDA’s MedWatch Adverse Event Reporting program either online, by regular mail or by fax. Your dog may be flawless and always listens to your commands. Your dog may be perfectly trained and would never move without your permission. Your dog may be friendly and love all of God’s creatures, humans and animals alike. You must still keep your dog on its leash. Keeping your dog on a leash is a legal requirement as stated in the Los Angeles Municipal Code Section 53.06.2. You must keep your dog leashed any time your dog is off your property. The same law applies in most municipal codes. Funnily enough, many people overlook this reason and let their dogs off the leash in public anyway. That may be because the law differs in different jurisdictions. Know the law in your area and keep your dog leashed. In most California jurisdictions, the leash length requirement is no longer than six feet. If you are using a retractable leash, it cannot stretch longer than the leash length requirement. So, you cannot use a 10-foot retractable leash even if you keep it at 6 feet long. Your dog must be kept on a leash anytime it is off your property. Many communities also have designated areas where dogs are permitted off leash. Dog parks, for example, provide citizens with a place to let their dogs run free and socialize with each other. Los Angeles does not waive leash laws for dogs whose owners have voice control over them. The penalties for failing to follow dog leash laws vary just as widely as the laws themselves. In Los Angeles County, police and animal control officers can issue citations to owners of dogs “at large.” Owners must appear in court and may be charged with a fine. The first offense will cost $100, the second will be $250 and the third will be $500. To Keep Your Dog Safe. Dogs that are under control are less likely to engage in something harmful, either to themselves or others. An off-leash dog can eat something it shouldn’t, drink polluted water, or encounter some harmful chemical another way. (Something that was sprayed on the grass, for example.) An unleashed dog can get into a dangerous situation with automobiles, people riding bicycles, broken glass, discarded, rancid food or a sick or rabid wild animal. A dog that’s roaming free can get sprayed by a skunk, encounter a porcupine or a rattlesnake, or get injured chasing some wildlife. A dog off a leash is not easily monitored. Dogs can become hypothermic when in cold water and run the risk of an accidental drowning. When summer temperatures get very hot, dogs can get heat stroke or heat exhaustion, both of which can result in serious injury and in rare cases can be fatal. A visit to an emergency pet hospital can be expensive even if it is only an easily treatable bacterial infection from surface water. It’s even more expensive and heartbreaking if an encounter causes severe illness or even death to the dog- that could have been prevented. So please leash your dog. By law, police officers on duty have the authority to shoot and kill your dog if they feel he may be a threat to them or impede their progress. (Even if they are the ones entering your yard.) Keep your dogs supervised and on a leash in public. A leashed dog’s actions are unlikely be misconstrued as a threat or impediment by officers of the law- or other people who are carrying arms for some reason. To Keep Other Dogs and Animals Safe. Keeping your dog on a leash keeps unwelcome encounters with other dogs under control. It prevents encounters with unfriendly dogs. Even dogs who may appear friendly at first can sometimes become aggressive during the greeting sniff, or may injure another dog by bowling into them or jumping on them. Dogs that roam free are more likely to chase wildlife and can spook horses, potentially injuring the riders and the horses. In addition, a spooked horse can kick a dog so hard that it usually results in a serious injury or a fatality. Think about other people’s pets before unleashing your dog. There have been instances where people taking their rabbits out for a walk out at the park were chased by unleashed dogs. And let’s not even talk about squirrels. Dog owners who let their animals run off leash can be cited for violations of the leash laws. In some jurisdictions, especially in Los Angeles, this means a court appearance on top of a fine. A court appearance can possibly mean spending hours of your day in court so that you can then pay your fine. The first offense will cost $100, the second will be $250 and the third will be $500. Dog owners are responsible and held liable for cleaning any mess their dogs make. Dog owners are responsible and held liable for what their dogs do to both humans and other animals. Any dog that causes a bite or a scratch on a human that involves dog saliva must be quarantined to ensure there is no threat of rabies. Keeping a dog quarantined is expensive and there is the high cost to consider: the treatment of the physical and emotional harm to a bite victim. Every day about one thousand U.S. citizens incur dog bites that require emergency attention. Dog bite law is a branch of law that greatly varies from state to state. California has noticed an increase in dangerous dogs and dog bites, and has created a set of laws that are especially stringent in order to keep its citizens safer. In California dog bite lawsuits, the defendant is liable for negligence per se if their dog causes injury to a person while at large in a public domain (excluding dog parks). To Keep Other People Safe. Not everyone is a “dog person”!! Many people don’t want to encounter loose dogs! Many people are afraid of dogs– or certain breeds of dogs. (Not naming any, of course.) Cynophobia!! It’s a real thing. People rely on leash laws when they go places. They go out with the expectation that there won’t be loose dogs to watch out for. When a dog is loose in areas with leash laws, people’s rights to move around in public places without encountering loose dogs is infringed. Not everyone you meet is physically able to withstand a dog jumping on them or running toward them. If your dog runs toward people and there is a collision, there could easily be scratches or injuries from a dog knocking down a child, a pregnant woman, or an elderly person. An unleashed dog can unintentionally cause injuries just by being friendly and jumping up to greet a person who is not able to handle it well. So please keep your dog on a leash in public places. Simvastatin is a generic form of Zocor. Zocor is a hypolipidemic, or anti-cholesterol, drug. It is a member of a class of drugs called statins. It’s made from the aspergillus terreus fungus and is used to reduce low-density lipoprotein (LDL) cholesterol. High LDL cholesterol levels (“bad” cholesterol) are associated with increased risk of stroke, heart attack, and cardiovascular death. The World Health Organization (WHO) considered Zocor one of the safest, most effective, essential medications on the market. In 2005, Zocor earned its manufacturer, Merck, more than $4.3 billion in sales to an estimated 2.1 million patients. To date, there have been ten recalls of Simvastatin. The biggest Simvastatin recall so far affected just over 54,000 bottles, which is relatively minor compared to other generic medications. (Lisinopril had over a million bottles recalled at once.) The biggest recall was the 2015 Class III recall by Micro Labs, involving 54,096 bottles. The reason for the Simvastatin Recall was impurities in the pills. There is no complete Simvastatin Recall from the market. However, due to FDA warnings, there are strict restrictions on the drug, especially the 80mg dose. In 2011, the FDA announced changes for the safety labels of Simvastatin, because of increased risk of injury while taking the highest dose of 80 milligrams. Risk of Injury is particularly high within the patient’s first 12 months of Zocor use at the 80mg dosage. The FDA advised that new patients should not be prescribed the 80mg dosage. Also, patients using 40mg doses of Zocor should not be increased to 80mgs. Instead, they should be switched to an alternative statin drug. In 2012, the FDA issued a Drug Safety Communication warning users of interactions between protease inhibitors and statins. Findings indicated that using both simultaneously leads to increased risk of muscle injury. The safety labels of the HIV protease inhibitors as well as the affected statins have been updated to communicate the risk to patients. All data came from the FDA’s Adverse Event Reporting System. This system is one of the main ways the FDA evaluates medicines after they have hit the market. Common side effects are headaches, constipation, and nausea. Simvastatin is contraindicated for patients with kidney trouble and pregnancy. Liver damage brought about by increased liver enzymes. This is a serious side effect that must be addressed immediately. There have also been some findings on Simvastatin Weight Gain. The weight gain may also be linked to sleep problems that can be set off by Simvastatin crossing into the brain. The resulting sleep disturbance can result in insulin resistance, weight gain, and generally affecting the patient’s quality of life in a negative way. The more severe side effects of Zocor occur in the muscles. Patients taking Zocor may develop myopathy, a condition that causes weakness and pain in the muscles. The muscle damage is often caused by the drug’s interaction with other medicines. Some people are just genetically predisposed to this kind of muscle damage disease. A risky, much less common side effect is Rhabdomyolysis, a fatal muscular disease. During rhabdomyolysis, the body’s muscles break down excessively and release myoglobin into the blood called myoglobin which can cause kidney damage. In severe cases, rhabdomyolysis can lead to kidney failure and death. Patients taking Zocor who experience muscle pain or tenderness, fatigue, weakness, or dark urine should seek immediate medical attention. Taking the 80mg dose of Simvastatin (the highest approved dose)have been found to be at greater risk for severe side effects, especially during the first year of treatment. A European study shows that patients taking statins may have a nine-percent increased risk for developing type 2 diabetes and/or liver disease. All of these findings caused the FDA to issue a recommendation: sharply limit the use of the 80mg simvastatin dose. Merck has been accused of misconduct by failing to warn the public of the risks associated with using Zocor. Allegedly, Merck was negligent in its duties to its customers by not warning users of the severe side effects in time to prevent them. Merck is accused of purposely withholding knowledge about the risky side effects of Zocor.